Xylan: 1070, 1014, 1025, 8840, 1052 etc. APPLICATIONS/ ADVANTAGES: B7 studs are best suited for use in temperatures between 300° - 400° C.
we deals in all types of fasteners like this is a coated fasteners. We offer ptfe and xylan coated fasteners which are high on demand list in the market that contain ptfe or other types of lubricants. The coating of xylan provides effectve solution to the problems in engineering construction regarding wrong surface properties arises. 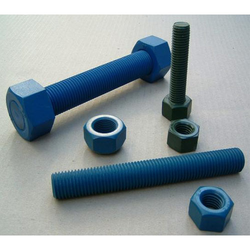 Coated Nuts and Stud bolts best suited for installations in offshore platforms, chemical plants, and petrochemical, installations near the sea and in corrosive environments. The resin-like bonded coating provides a low coefficient of friction and excellent resistance to many chemicals and acids. PTFE dry film provides lubricity, thus preventing galling in breaking out. 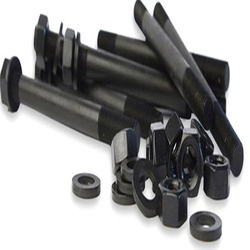 Leading supplier of Teflon Coated Bolts as per customers requirement with best quality from Chennai, India.